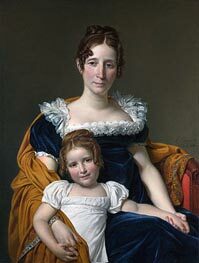 Jacques-Louis David (August 30, 1748 – December 29, 1825) was a highly influential French painter in the Neoclassical style. 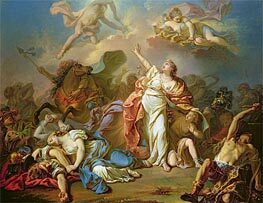 In the 1780s his cerebral brand of History painting marked a change in taste away from Rococo frivolity towards a classical austerity and severity, chiming with the moral climate of the final years of the ancien régime. David later became an active supporter of the French Revolution and friend of Maximilien de Robespierre, and was effectively a dictator of the arts under the French Republic. Imprisoned after Robespierre's fall from power, he aligned himself with yet another political regime upon his release, that of Napoleon I. It was at this time that he developed his 'Empire style', notable for its use of warm Venetian colours. David had a huge number of pupils, making him the strongest influence in French art of the 19th century, especially academic Salon painting. 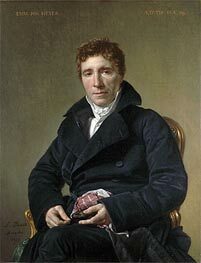 Jacques-Louis David was born into a prosperous family in Paris on August 30, 1748. When he was nine, his father was killed in a duel, and his mother left him with his prosperous architect uncles. They saw to it that he received an excellent education at the College des Quatre Nations, but he was never a good student; he had a tumor that impeded his speech, and he was always too busy drawing. He covered his notebooks with his drawings, and he once said, “I was always hiding behind the instructor’s chair, drawing for the duration of the class.” Soon, he desired to be a painter, but his uncles and mother wanted him to be a soldier. He soon overcame the opposition, and went to learn from François Boucher, the leading painter of the time, who was also a distant relative. Boucher was a Rococo painter, which was falling out of style and becoming more classical. Boucher decided that instead of taking over David’s tutelage, he would send David to his friend Joseph-Marie Vien, a mediocre painter, but one that embraced the classical reaction to Rococo. There David attended the Royal Academy, based in what is now the Louvre. David attempted to win the Prix de Rome, an art scholarship to the French Academy in Rome four times. Once, he lost, according to legend, because he had not consulted Vien, one of the judges. Another time, he lost because a few other students had been competing for years, and Vien felt David’s education could wait for these other mediocre painters. In protest, he attempted to starve himself to death. Finally, in 1774, David won the Prix de Rome. Normally, he would have had to attend another school before attending the Academy in Rome, but Vien’s influence kept him out of it. 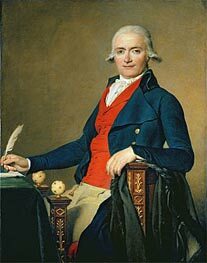 He went to Italy with Vien in 1775, as Vien had been appointed director of the French Academy at Rome. While in Italy, David observed the Italian masterpieces and the ruins of ancient Rome. David filled sketchbooks with material that he would derive from for the rest of his life. While in Rome, he studied great masters, and came to favor above all others Raphael. In 1779, David was able to see the ruins of Pompeii, and was filled with wonder. After this, he sought to revolutionize the art world with the "eternal" concepts of classicism. David's fellow students at the academy found him difficult to get along with, but they recognized his genius. David was allowed to stay at the French Academy in Rome for an extra year, but after 5 years in Rome, he returned to Paris. There, he found people ready to use their influence for him, and he was made a member of the Royal Academy. He sent two paintings to the royal academy, and both were included in the Salon of 1781, a high honor. He was praised by his famous contemporary painters, but the administration of the Royal Academy was very hostile to this young upstart. After the Salon, the King granted David lodging in the Louvre, an ancient and much desired privilege of great artists. When the contractor of the King's buildings, M. Pecol, was arranging with David, he asked the artist to marry his daughter, Marguerite Charlotte. This marriage brought him money and eventually four children. David had his own pupils, about 40 to 50, and was commissioned by the government to paint "Horace defended by his Father," but Jacques soon decided, "Only in Rome can I paint Romans." His father in law provided the money he needed for the trip, and David headed for Rome with his wife and his favorite student, the Prix de Rome winner of that year. In Rome, David painted his famous Oath of the Horatii. 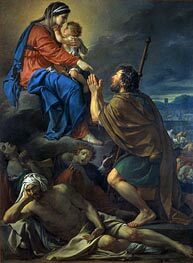 "This painting occupies an extremely important place in the body of David’s work and in the history of French painting. The story was taken from Livy. We are in the period of the wars between Rome and Alba, in 669 B.C. It has been decided that the dispute between the two cities must be settled by an unusual form of combat to be fought by two groups of three champions each. The two groups are the three Horatii brothers and the three Curiatii brothers. The drama lay in the fact that one of the sisters of the Curiatii, Sabina, is married to one of the Horatii, while one of the sisters of the Horatii, Camilla, is betrothed to one of the Curiatii. Despite the ties between the two families, the Horatii's father exhorts his sons to fight the Curiatii and they obey, despite the lamentations of the women." Priests, cardinals, princes and princesses came to see David’s incredible work, eulogies were created for the painting, and even the Pope wanted to see The Oath. David wanted the painting in the Salon, but it arrived late, and was hung in a bad position by people opposed to David at the Academy. Finally, public uproar made it necessary to move the painting to a better position. In 1787, David did not become the Director of the French Academy in Rome, a position he wanted dearly. The Count in charge of the appointments said David was too young, but said he would support Jacques in 6 to 12 years. This situation would be one of many that would cause him to lash out at the Academy in years to come. 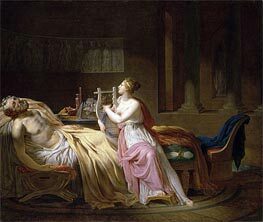 For the salon of 1787, David exhibited his famous Death of Socrates. "Condemned to death, Socrates, strong, calm and at peace, discusses the immortality of the soul. 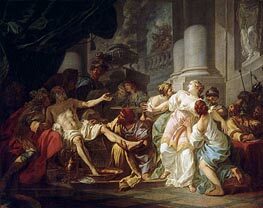 Surrounded by Crito, his grieving friends and students, he is teaching, philosophizing, and in fact, thanking the God of Health, Asclepius, for the hemlock brew which will insure a peaceful death… The wife of Socrates can be seen grieving alone outside the chamber, dismissed for her weakness. Plato (not present when Socrates died) is depicted as an old man seated at the end of the bed." Critics compared the Socrates with Michelangelo’s Sistine Ceiling and Raphael's Stanze, and one, after ten visits to the Salon, described it as "in every sense perfect". Denis Diderot said it looked like he copied it from some ancient bas-relief. The painting was very much in tune with the political climate at the time. For this painting, David was not honored by a royal "works of encouragement". For his next painting, David painted The Lictors Bring to Brutus the Bodies of His Sons. The work had tremendous appeal for the time. Before the opening of the Salon, the French Revolution had begun. The National Assembly had been established, and the Bastille had fallen. The royal court did not want propaganda agitating the people, so all paintings had to be checked before being hung. Some portraits of famous people were banned, like the portrait of a chemist who happened to be a member of an ill-favored party. When the newspapers reported that the government had not allowed the showing of The Lictors Bring to Brutus the Bodies of His Sons, the people were outraged, and the royals gave in. The painting was hung in the exhibition, protected by art students. 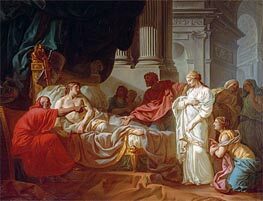 The painting depicts Lucius Junius Brutus, the Roman leader, grieving for his sons. Brutus's sons had attempted to overthrow the government and restore the monarchy, so the father ordered their death to maintain the republic. Thus, Brutus was the heroic defender of the republic, at the cost of his own family. On the right, the Mother holds her two daughters, and the grandmother is seen on the far right, in anguish. Brutus sits on the left, alone, brooding, but knowing what he did was best for his country. The whole painting was a Republican symbol, and obviously had immense meaning during these times in France. Soon, David turned his critical sights on Royal Academy of Painting and Sculpture. This attack was probably caused primarily by hypocrisy of the organization and, and their personal opposition against his work, as seen in previous episodes in David’s life. The Royal Academy was chock full of royalists, and David’s attempt to reform it did not go over well with the members. However, the deck was stacked against this symbol of the old republic, and the National Assembly ordered it to make changes to conform to the new constitution. David then began work on something that would later hound him: propaganda for the new republic. David’s painting of Brutus was shown during the play Brutus, by the famous Frenchman, Voltaire. The people responded in an uproar of approval. On June 20, 1790, the anniversary of the first act of defiance against the King, the oath of the tennis court was celebrated. Wanting to commemorate the event in a painting, the Jacobins, revolutionaries that had taken to meeting in the Jacobin Monastery, decided that they would choose the painter whose “genius anticipated the revolution.” David accepted, and began work on a mammoth canvas. The picture was never fully completed, because of its immense size (35ft. by 36ft.) and because people that needed to sit for it disappeared in the Reign of Terror, but several finished drawings exist. When Voltaire died in 1778, the church denied him a Church burial, and his body was interred near a monastery. A year later, Voltaire’s old friends began a campaign to have his body buried in the Panthéon, as church property had been confiscated by the French Government. David was appointed to head the organizing committee for the ceremony, a parade through the streets of Paris to the Panthéon. Despite rain, and opposition from conservatives based on the amount of money that was being spent, the procession went ahead. Up to 100,000 people watched the “Father of the Revolution” be carried to his resting place. This was the first of many large festivals organized by David for the republic. He went on to organize festivals for martyrs that died fighting royalists. These funerals echoed the religious festivals of the pagan Greeks and Romans and are seen by many as Saturnalian. In 1791, the King attempted to flee the country, and the emperor of Austria announced his intention to restore the monarchy. In reaction, the people arrested the King. The monarchy was finally destroyed by the French people in 1792. When the new National Convention held its first meeting, David was sitting with his friends Jean-Paul Marat and Robespierre. In the Convention, David soon earned a nickname: “ferocious terrorist.” Soon, Robespierre’s agents discovered a secret vault of the king’s proving he was trying to overthrow the government, and demanded his execution. The National Convention held the trial of Louis XVI and David voted for the death of the King, which caused his wife, a royalist, to divorce him. When Louis XVI was executed on January 21, 1793, another man died as well — Le Peletier. He was killed by a royal bodyguard for voting for the death of the King. David was called upon once again to organize a funeral, and David painted Le Peletier Assassinated. It depicts a bloody sword hanging from a thread, thrust through a note that states “I vote the death of the tyrant.” Le Peletier’s body is below this sword. The painting has disappeared, and is known only by a drawing, contemporary accounts and an engraving. Soon, David’s friend Marat was assassinated by Charlotte Corday, a woman of an opposing political party, whose name can be seen in the note Marat holds in David’s painting. David once again organized a spectacular funeral, and Marat was buried in the Panthéon. Marat died in the bathtub, writing. David wanted to have his body submerged in the bathtub during the funeral procession, but the body had begun to putrefy too much. Instead, Marat’s body was periodically sprinkled with water as the people came to see his corpse, complete with gaping wound. David later completed his perhaps most famous painting, The Death of Marat, which has been called the Pietà of the revolution. Upon presenting the painting to the convention, he said “Citizens, the people were again calling for their friend; their desolate voice was heard: David, take up your brushes.., avenge Marat... I heard the voice of the people. I obeyed.” David had to work quickly, but the result was a simple and powerful image. Everything in the picture leads back to Marat’s head. Soon, the war began to go well; French troops marched across Belgium, and the emergency that had placed the Committee of Public Safety in control was no more. Then, plotters seized Robespierre at the National Convention. During this seizure, David yelled to his friend “if you drink hemlock, I shall drink it with you.” After all this excitement, he fell ill, and did not attend the evening session, which saved him from being guillotined as Robespierre. David was arrested and placed in prison. There, David was alone; no one could pose for him, so he painted his self portrait, and his jailer. After David’s wife visited him in jail, he conceived the idea of telling the story of the Sabine Women. The Sabine Women Enforcing Peace by Running between the Combatants, also called The Intervention of the Sabine Women is said to have been painted to honor his wife, with the theme being love prevailing over conflict. The painting was also seen as a plea for the people to reunite after the bloodshed of the revolution. This work also brought him to the attention of Napoleon. The story for the painting is as follows: “The Romans have abducted the daughters of their neighbors, the Sabines. To avenge this abduction, the Sabines attacked Rome, although not immediately – since Hersilia, the daughter of Tatius, the leader of the Sabines, had been married to Romulus, the Roman leader, and then had two children by him in the interim. Here we see Hersilia between her father and husband as she adjures the warriors on both sides not to take wives away from their husbands or mothers away from their children. The other Sabine Women join in her exhortations.” During this time, the martyrs of the revolution were taken from the Panthenon and buried in common ground, and revolutionary statues were destroyed. When he was finally released to the country, France had changed. His wife managed to get David released from prison, and he wrote letters to his former wife, and told her he never ceased loving her. He remarried her in 1796. Finally, wholly restored to his position, he retreated to his studio, took pupils and retired from politics. 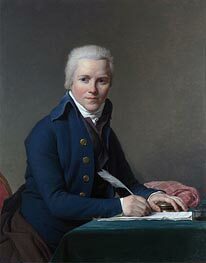 During this time in prison, 1784-1794, some of his greatest works were completed. Napoleon visited his studio in 1797, and David recorded his face, which later became his famous Napoleon crossing the St Bernard Pass. 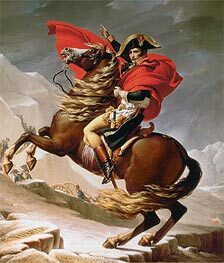 Napoleon actually had used a mule, but instead he insisted that David paint his favorite horse. Napoleon had high esteem for David, and asked him to accompany him to Egypt, but David refused. After the proclamation of the empire, he became the official court painter of the regime. 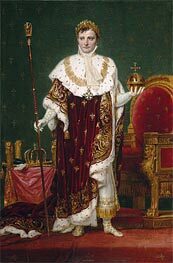 One of the works David was commissioned for was The Coronation of Napoleon in Notre Dame. David was permitted to watch the event. He had plans of Notre Dame delivered and participants in the coronation came to his studio to pose individually. For his background, David had the choir of Notre Dame act as his fill-in characters. The Pope came to sit for the painting, and actually blessed David. Napoleon came to see the painter, stared at the canvas for an hour and said “David, I salute you.” David had to redo several parts of the painting because of Napoleon's various whims, and for this painting, David received only 24,000 Francs. Napoleon attempted to take over all Europe, and with his incredible genius nearly did. Napoleon's attempts at sea were ended by Admiral Nelson, but a combined Austrian Russian army was defeated at Austerlitz solely by the emperor’s genius, which made him master of Germany. Napoleon, encouraged by his victories, turned to Spain, and lost slowly due to guerilla warfare backed by England. Napoleon attempted to wipe out the Russians, but it proved his undoing. The Russians retreated, burning everything in their path, and the winter froze the French army. Napoleon swiftly retreated to Paris to raise a new army to counter the Quadruple Alliance of Britain, Austria, Russia and Prussia, but the alliance armies managed to drive all the way to Paris, where Louis XVIII took the throne. After the Bourbons returned to power, David was exiled at the age of 65, as he had voted to kill the King. He asked the Pope if he could come to Rome, but the Pope, obeying the allies, refused. He went to Brussels, where the King welcomed him. There, he painted Cupid and Psyche and lived out the last days of his life quietly with his wife, whom he had remarried. During this time, he only did scenes from Greek and Roman mythology. His last great work, Mars Disarmed by Venus and the Three Graces was begun in 1822 and was finished the year before his death. “David wanted to outdo himself once more. In December 1823, he wrote: "This is the last picture I want to paint, but I want to surpass myself in it. I will put the date of my 75 years on it and afterwards I will never again pick up my brush." The subject is taken from Greek mythology…David was faithful to the legend… The coloring is translucent and pearly, like painting on porcelain.” The painting was first shown in Brussels and then was sent to Paris, where David's former students flocked to see the painting. The exhibit managed to bring in after operating costs, 13,000 francs, meaning there were more than 10,000 visitors, a huge amount for the time. When David was leaving the theater, he was hit by a carriage and later died of deformations to the heart in December 29, 1824. After his death, some of his portrait paintings were sold at auction in Paris, with his paintings going for very small sums. 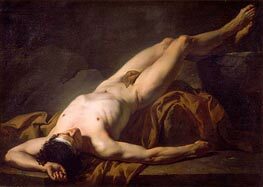 His famous painting of Marat was shown in a special secluded room so as not to outrage the public. David’s body was not allowed into France and was therefore buried in Brussels, but his heart was buried at Père Lachaise, Paris.